Feelings of loss, yes, definitely – both on a personal note and as part of humanity. Boston; West, Texas; Bangladesh… Strangely, Meg wrote this just before the horrific events of last week and yet the first few lines capture so well the sense of common bonds and empathy, and the shared, collective wave of grief passed hand to hand like a tragic baton, across the country and around the world. In addition to the anger, sadness and frustration over these specific tragedies, there is the feeling of helplessness over the scale of the world’s societal, political and environmental ills. Work has been very stressful lately. I deal with endangered species and ecosystem recovery and the problems continue to grow as the budgets to fix them shrink. Just today I read a depressing study on the state of the world’s groundwater system in terms of over-utilization and pollution. And then there are the small, personal things that pale in comparison but still cause anxiety – health concerns and gnawing practical details like will I find a place to park my tiny house once it is built, which state will I end up in, what will I do next with my life and how will I afford it. There’s a disquieting amount of change and uncertainty looming around most people I know these days. The poem’s image of a purifying, flowing river of shared experience and letting go has other relevance to our lives as well. Questioning and releasing old, outdated perceptions of ourselves that we stubbornly cling to and letting them wash away. Or the idea of setting those close to us free with no expectations, no obligations, no cages, only love and support for their journey. 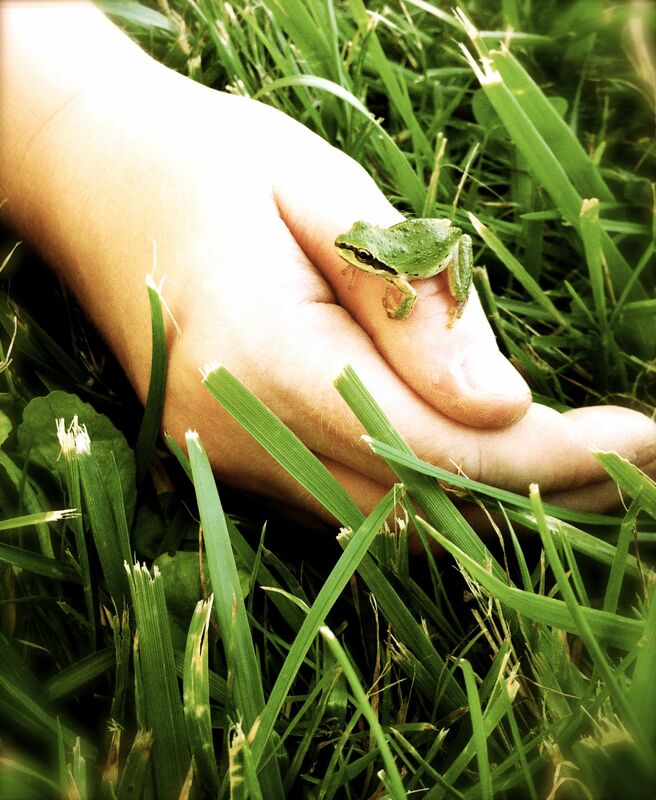 A tree frog on my nephew’s hand – free to go, choosing to stay. Also embodied in the poem is the notion of the passing of genes and experience and knowledge from parent to child, and the hard requirement of letting them go, to let them venture on beyond – exploring, hopeful beacons for the future, maybe teaching us a new trick or two about joy in return. 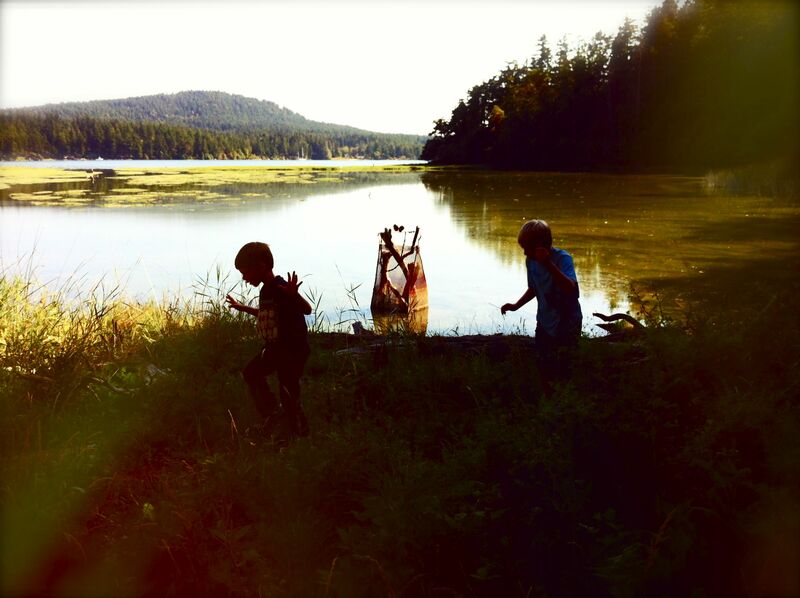 My nephews exploring a lake near Roche Harbor, San Juan Island, WA. And then there’s the really mundane interpretation, the letting go of stuff. For some reason I’ve broken three glasses this last month, but in my move toward downsizing, I realized it just meant less decisions to make. I took a load to Goodwill and felt that much lighter. In a recent rainstorm, I pulled out my already bent umbrella and it gave up the ghost – neither expanding nor closing. Walking by a garbage can I tipped it in and splashed on through the rain. Gleefully, I decided I didn’t really care and turned my face to the sky. In honor of April being poetry month, we have a long tradition at work of sending around poems we like. When I sent this poem fragment out to my co-workers a couple weeks ago, I included a note about how it struck a chord since I was in the process of designing and building a tiny house on wheels and downsizing my life. You can imagine my surprise when one of my co-workers replied that she has a good friend who has built a tiny house and was living in the Bay Area. Even more surprising is that her friend turns out to be Colin, whose post I had loved on the Tiny House Blog and that I had recently forwarded to some other friends interested in building a tiny house! I’m leaving in an hour to meet Colin and see his home. He’s been extremely kind, offering to help answer questions and share his experiences. Coincidently, the same day I was emailing with Colin, Tammy and Logan (RowdyKittens and Smalltopia) invited me up to Shasta to visit their little house. They also have been really helpful answering my many queries and I’m looking forward to seeing them on Sunday. Plan for your life, and let go of the results. Thanks for the poetry, the quote, and the musings. Oh, and the photographs. Thanks so much for this….so many powerful words and ideas. I too am in the ‘letting go” mode and it is surprisingly difficult. Kate–your posts are like walking barefoot through the grass in the morning. Aw thanks, Joan – appreciate it. Yes, it’s much easier to talk about it, or write about it, than to actually do it. But at least it helps me figure out what I’m holding on to and whether it’s important and healthy or not. Most often not. Throwing grief and/or loss into the mix makes it even harder. I wish you all the best in what you are going through. this feels like good medicine as i sit here and grieve dreams that are now heading toward the sea. Ebb and flow. 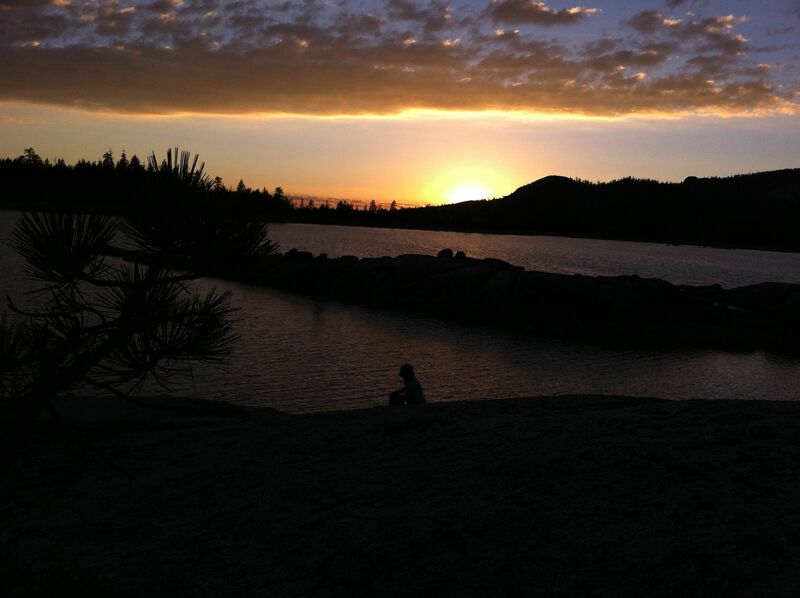 Letting go can be so painful when we want to hang on to that which once made us feel so good.